There is a breed of people who, when saying to themselves, “Dude, this could be better,” don’t just decide that what’s in front of them “ is fine” or “is what it is.” They keep searching, asking questions, maybe even taking those extra few minutes to send a suggestion to the company. They are investigative by nature and love to share insights. Trouble is, these envelope pushers rarely get the opportunity to directly affect the products and services available to them in the market. Well, here is that opportunity! We know our best ideas come from the business owners we strive to empower. We’re on the hunt for the top feedback-giving, gadget-trying, solution-searching business owners who want to kick PaySimple in the tires and tell us all their honest thoughts. These are – the perfectionist-types who work every day to manage their businesses and lives better. So. You think you’re one of them? 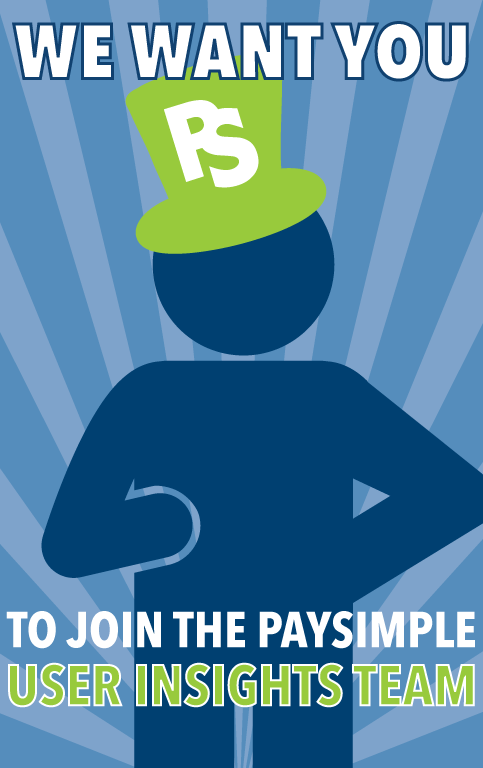 We want you to join the PaySimple User Insights Team. If chosen, you’ll get six months of PaySimple Pro for FREE – only paying for the transaction fees of the payments you process. In return, we want to know how it’s working (or how it could work even better) for your business. If we launch a new feature, you’ll be the first to know We’ll be counting on your input. You have an idea for a zippy new feature? We want to be the first to know, and we are going to listen (ok, we listen to everyone, but we might send you some schwag if we use your idea). We’ll reach out periodically during your six-month experience to get your feedback with quick monthly surveys, social media outreach, or chats over email. We know you’re over-opinionated when it comes to your business, but we’re pretty good listeners and we love it when you vent…really. You own an established business registered in the U.S.
Click here to take quick five-minute survey and tell us a little bit about yourself and your business. Please respond by Friday, April 5th. We’ll review the responses, handpick our users, and let you know if you’ve been selected. Need more information on PaySimple? Here’s a quick demo of what we can do for your business. Manage and Grow your Small Business with PaySimple: Demo from PaySimple on Vimeo. We can’t wait to hear from you – click now to complete the survey!